Deciduous tree. Multiple trunks. Fast vigorous growth. Can be single stemmed or multi trunk. 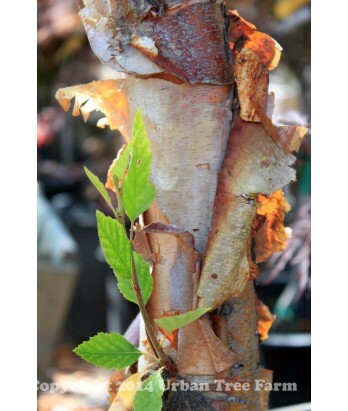 Salmon-cream to brownish bark which exfoliates to reveal a creamy white inner bark that can be nearly as white as the white-barked birches. Leathery, diamond-shaped, dark green leaves with doubly toothed margins are large in size. Thrives in problematic low wet soils and high water table. Regular to ample water needs once established.